I discovered the Bioré U Body Washes back in April when I ordered the one in Yasuragi Green. 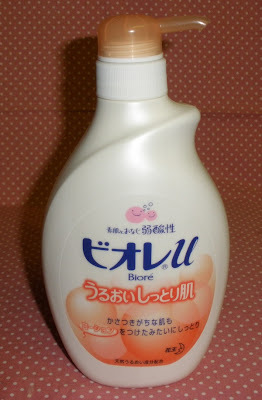 That one is still my top favorite body wash as it smells sooooo good and doesn´t dry out my skin (like the Naive Body Soaps from Kracie). I even got the refill of the Yasuragi Green which I used already! 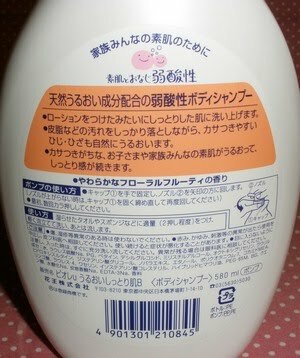 Some weeks later in May I got another version, the Moisture Body Wash in the bottle with the orange label. Again this is the large size with a pump which contains 580ml (lasts for really long for me, about 2 months with daily use but since I have about 4 different huge pump-bottles of body wash in my bathroom it can last longer) and which turns out to be an economical choice because I can refill it (refill of course is cheaper) and after all even if I pay the jacked-up eBay price the long-term price for me is ok. Anyway, I love the Moisture Body Wash as much as the Yasuragi Green because it smells really good, too, similarly fresh but a bit softer and creamier. Texture-wise the Moisture Body Wash lathers up to a soft foam which is really gentle and makes my skin soft and smooth without drying it out. Overall highly recommended and I purchased a refill for this soap, too =) I got mine on eBay where you can easily find this when doing a search. what does the orange label smell like compared to the green one? thanks! what does this one smell like compared to the green one ?thanks!